Given the sheer number of comic book remakes, reboots, and spinoffs released each year that all draw from the same creative well, by now the origin story has become the Kryptonite of comic book adaptations. 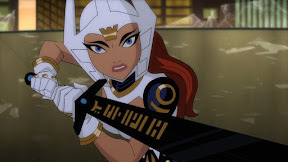 As expected as a syllabus on the first day of school, while typically these predictable prologues grind the action to a halt, Justice League: Gods and Monsters takes a decidedly different approach by crafting completely new backstories for the Justice League A-listers of Superman, Batman, and Wonder Woman whom we mistakenly thought we knew so well. 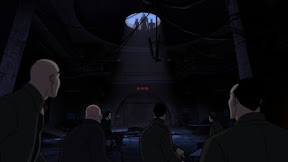 Of course, from online fan fiction to the daring interpretations of Batman via Frank Miller's Dark Knight Returns (which inspired two very different adaptations by directors Tim Burton and Christopher Nolan), dark, dystopian plays on pop culture and popular material are nothing new. But Justice League: Gods and Monsters takes it even further, moving past mere technique to bring us a whole new world populated by Gotham's now even darker knight, along with two of his fellow crime-fighters. 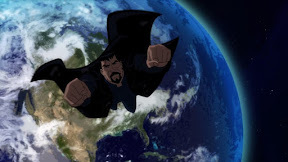 Stating that "the past is like another planet," this D.C. Comics full-length animated revisionist feature begins in space, which is the perfect place to introduce us to an alternate Justice League universe. In a shocking twist on nature vs. nurture, not only is Superman's parentage hijacked by Zod (who imprints his own DNA to become the baby's biological father), but shortly into the movie, the child crash lands in Mexico as opposed to the American Midwest, giving Superman's oft-cited status as an illegal alien a timely politically layer. Far from being the only character with a complicated past, this time around, college science nerd Kirk (instead of the dated moniker Bruce Wayne) is turned into the now vampiric Batman after a research experiment goes terribly wrong. Although that Spiderman style twist makes him a reject on dating websites like eHarmony, Kirk puts his thirst for blood to good use. Engaging in some surprisingly violent superhero warfare that pushes the PG-13 rating to the limit in the first act alone, Kirk teams up with the temperamental Superman as well as the now Game of Thrones inspired goddess Wonder Woman whose arranged marriage as the daughter of the God of War turns into a post-nuptial massacre. A far cry from the Dudley Do-Rights of series past as brought to life in popular '90s animated series, these Gods and Monsters are all too eager to wipe the floor with the opposition. 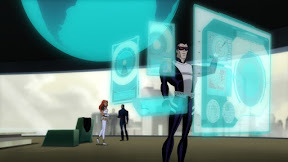 Establishing its fast pace right from the start, Gods and Monsters makes a hell of a first impression by kicking off just one of several action sequences that feel refreshingly organic when compared with some of the other "plug and play" moments of car chases and fights seasoned throughout other DC Comics films such as Son of Batman. Earning a bad reputation and an ever increasing number of enemies, it isn't long before the film's characters are being set-up for the murders of scientists. And while they're baffled as to who would have the guts to try and frame the trio, Justice League: Gods and Monsters continues to swing back and forth like a pendulum – attempting to fill us in on the role that past events may have played in forming the people they've become today and those whose paths they've crossed. With so much new material to cover in such a short running time, the filmmakers were smart to only focus on three members of the D.C. Comics crew. Yet because in stark contrast to most superhero adaptations, the origin stories are far more compelling than the otherwise by-the-numbers contemporary plotline, perhaps Justice League would've played even better if it had placed only one (or at most two) protagonists under the revisionist microscope before working in additional characters in a follow-up film. And while it's easy to overlook its at times chaotic construction, it soon makes sense why pasts were compared to planets in the film as – particularly when we jump from Batman to Wonder Woman – the move from one person's past to that of another can feel as awkward as going from one planet to the next. Timing the release to help build up momentum for WB's upcoming live-action feature that centers around the very same superheroes, although the narrative of Gods and Monsters isn't quite as rock-solid as other titles in the animated series, it's nonetheless one of DC Comics' most creatively ambitious efforts in recent memory.